My niece, that is rather than me! She is on a Cnoc 16 which she first got to test out in the summer. 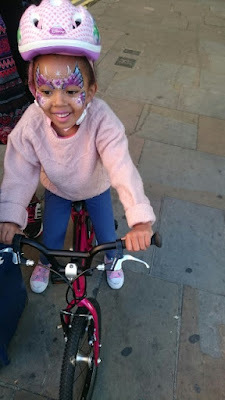 Although my niece was only new to bike riding and had never ridden a two-wheeler before she quickly mastered being able to ride with no stabilisers. We took the pedals off and my niece used the Cnoc 16 as a balance bike for a couple of weeks - and she said riding it was great! I would definitely recommend this as a way for children learning to ride a bike. That way they learn the art of balancing straight away, and you won't get the tantrums linked to removing stabilisers from a kid who has gotten used to assisted balancing! My niece rode around the park near her house, and also in Hyde Park. She then went for a spin at Ride London in the summer and enjoyed the experience so much she wanted to graduate immediately to doing bike tricks like the big boys doing the BMX tricks demonstration! So now we are heading in to winter there are fewer opportunities to ride than in the summer, but it hasn't stopped my niece enjoying her Islabike Cnoc16. I am sure that the quality of the bike and its components, as well as its lightness have contributed towards her positive experience. My niece is not so sporty and tends to prefer arts and crafts, but when she got the bike it suddenly gave her something new to get enthusiastic about. 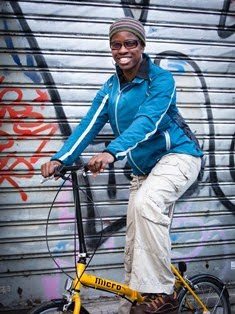 I hope she carries on biking. You can read my review of the Islabike Cnoc 16 on the Sportsister website. This seems like a great way to get kids into cycling even more. To make them appreciate it better at such an early age would definitely go a long way. Thanks for sharing this! Thanks for your comment, Lisa. Well, it seems to be working for my niece as she is quite enjoying biking!